Showing 52 of 170 VWO ratings and reviews. VWO Review: "Great product for getting started with web testing"
VWO is being used primarily by a consultant agency of ours, who is using it to facilitate work on our website. My team has full access to the results, but we rely on the consultant to develop the tests and analyze the results. I personally access VWO mainly to dive deeper into the results and approve testing plans. A/B testing in a way that does not require changes to the website instance itself. Heatmap testing with minimal negative impact on load times and performance. Specific user recordings for more information when desired. We still have to rely on Google Analytics for a lot of user data and tracking. No good way to connect to Google Analytics goals and funnels, so there are redundant options. Forms do not provide better UX than other survey tools, so we have to choose UX over data collection. An excellent product to bridge the gap if you want to create an environment of constant testing and tracking in a low-risk way, but don't have the tools to handle it within your core website development platform. It lacks integration options and the ability to push out changes, so there are still manual steps needed in both data analysis and web development. VWO Review: "Extremely robust website testing tool. Highly recommended!" We use VWO to test new website designs and to tweak existing designs improve conversion rate. We run A/B tests for page design changes. We also run split URL tests for major page redesigns. We run ongoing conversion campaigns. I've found that creating a campaign which involves multiple pages is extremely time-consuming to set up. I haven't done this in a while so maybe the process has improved, but I'm not aware if it has. I think it's well suited for many types of testing. I'm not sure where it would not be appropriate. VWO Review: "Great for Enterpise and SMBs alike!" The VWO platform is being used across our entire organization. We are on eCommerce only business models so mastering the UX/UI is vital. We are using this to A/B test copy, visuals, check out, carts, and overall landing page experiences. We are narrowing down all the pain pints of our site as we go into a site re-design next year. Copy: A/B testing copy as an overlay on top of photos or below. Placement of copy is crucial to mobile first strategies and above the fold landscapes. Videos: A//B testing videos and video length. Trying to cap the engagement rate against time being watched. Also A/B testing where videos are best placed. Are they best used in the home page or product page or both. Visually, for people who are not familiar with the platform- can be overwhelming. Copy outruns the visual capacity and can cause fear of use. Training: a university type excercose is also recommended. Though VWO can be used for many functions- an in-depth course should be offered and/or required. Especially for how A/B tests run. Functionality is great. Each test is its own environment. They are bracketed off and do areat job with which is active and non-active. User Review: "A Candid Opinion on VWO from Mad Paws"
We're using it primarily for Heatmaps and Session Recording. We want a bit of quantitative data to back up our user research which powers our product decisions. It hasn't quite spread beyond the product team yet. Very powerful heatmaps and scrollmaps. Great screen recording with segmentation capabilities. Point and click interfaces for heatmaps. No need to use manual selectors or code. Usability. There's so much to take in and what feels like a steep learning curve. Performance. The app feels really clunky and slow. Seems like it's built for the type of person who has 40 hrs to spend a week on CRO. I have 1-2 hours. I want to be in and out to create a test. Then back in when we have some data. Analyse it, and be out again. There's a huge cognitive load using it, especially as I don't use it daily. "VWO helped me see a 200% increase in conversion rate"
We use VWO for our product's website. We started with a mere CTA button and A/B tests and now have moved on to Split URL and multivariate tests. Now, most of the things which go into the website are first thoroughly tested using VWO to make a data-driven decision rather than just relying on guts. Their UI for creating tests is brilliant. Does not require coding knowledge to set up basic to intermediate tests. VWO's support team is one of the primary reasons to stick with them. They are very fast and always provide an in-depth solution. The targeting options are good too, they give you the liberty to test a different set of audiences as well. There is a problem with creating responsive tests. The process involves creating two sets of test for mobile and web audiences. Which is time-consuming. Their reporting could be better. At times there is just too much data to see on the reporting page and the viewer gets confused. The tests are slow to load on slow networks. Which gives away the purpose at the start itself. VWO is best suited for running fast and efficient A/B tests. If you are just starting with A/B testing, it is the easiest option out there. VWO is very cost efficient as well. Haven't worked too much to point out the flaws, but responsive tests are something which I am looking forward to. User Review: "VWO - A Great Value With Limitations"
VWO is used throughout our company across multiple assets. We use VWO as the primary A/B testing platform in our optimization efforts. This lets our product, optimization, and engineering teams test out anything from simple changes to large impact concepts with minimal resources. Easy to use for most tests. The learning curve is generally low so we have been able to ramp up use quickly. Multi-goal reporting. This is highly valuable and easy to setup. Limited real time targeting. VWO lacks in behavioral segmentation such setting up segmentation by 'people who add something to their cart'. Reporting at scale is a very manual process. The API allows access to data, but that requires more dev work to setup useful reporting at scale. It's great for small to medium size businesses or really any business that needs page load level changes. Enterprise level and highly mature companies that are at a point where they need real-time behavioral segmentation (user has an item in their cart) are out of luck with VWO. User Review: "VWO for browser extension"
We had a not-so-standard use case for VWO. Our product is a browser extension and we wanted to split test certain parts of it with having control on what was being split tested. It was used by our relatively small dev team and the results were handed to the business team to analyse. I believe that if you have enough traffic it's a great solution for split testing your website. In our case of a browser extension, VWO was more of a workaround which ended up working really great. Review: "VWO: Definitley a buy at the price point." VWO is currently our base testing application for all things A/B and Multivariate testing. This is both on the WWW and within our web app. Primarily, VWO is used by our product and marketing teams to test headlines, funnel changes, and changes in page design. From a business perspective, we use it to test for conversion optimization. Essentially, we want to track how users convert, across multiple goals within our platform. VWO is appropriate for any company looking to engage in advanced testing based on user feedback. VWO Review: "Sometimes clunky, but always useful and valuable"
Our growth department works with clients using VWO to address potential areas in which their e-commerce sites could attract and keep more customers. It's the primary tool that we use to turn conversion rate optimization proposals into concrete data that we can then use to inform clients and make actionable recommendations. Organization and management of multiple A/B tests paused or running at once is very well laid out and intuitive. Heatmaps have provided a huge amount of actionable data in focused testing areas. A/B test overview data is very easy to make inferences from because of its simple and visually outstanding presentation. The Chrome extension tends to have issues loading Heatmaps. It's not uncommon to go to a Heatmaps page and have to refresh the page at least once in order for the extension to load correctly. The visual editor for making variations for A/B tests feels clunky and often doesn't appear in the final version (previewing the variation as a page on its own) as it does in the editor. At times the undo button has caused erratic behavior such as duplicating or "redoing" several of the same action at once rather than stepping backward. Overall, if there were any way to decrease the amount of time that the Chrome extension takes to load, I could see workflow across several areas being greatly improved. I would say the primary determinant of Visual Website Optimizer's usefulness is the amount of data coming from the website(s) you're analyzing. In the case of sites less focused on conversions or those with less traffic, data can be volatile and/or confounding (your hypothesis might be strong but the data isn't actionable). I would recommend its use for any conversion-focused sites that have a relatively predictable and steady flow of traffic. 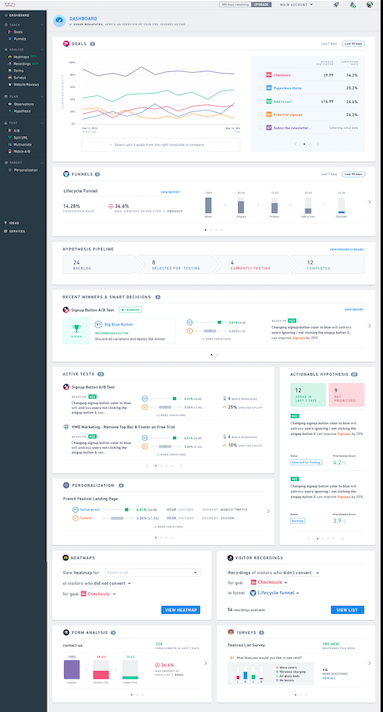 VWO Review: "Great Website Optimisation Tool to help inform product decisions and improve user onboarding"
We use VWO within the product development department to test new product ideas before implementing them and make data-driven decisions of changes to our e-commerce website. Only one person in the organisation uses VWO, but experiments and hypothesis are developed in collaboration with the CEO, CTO and Head of Customer Support. It helps us address the business problem of identifying what changes can have the most impact on increasing conversion rates, while prioritising new product ideas and validating assumptions. Relatively easy for people without a developer background to make tactical changes to website content that may influence customer behaviour while comparing effects on both desktop and mobile. VWO provides a good overview of results and data captured, allowing teams to collaborate and structure multiple tests simultaneously with endless segmentation options that are particularly useful when optimising certain user groups. The A/B testing feature is particularly useful with clear indications of when results are significant and easy interfaces to compare versions. I only use A/B testing because that's the only thing someone has taught me hands-on to do. I know there is more functionality available but it is not clear when you're logged in which features require an upgrade vs. which ones you can access. Very well suited for running A/B tests that require no developer support/html/code editing. Our developer team is very time-poor so any experiments that can run without their input are much easier to implement. Review: "VWO is a reliable split testing platform"
VWO is being used by our front end design and development team. We split test new ideas frequently in hopes of increasing our overall conversion rate over time and we have recently contracted a conversion rate optimization company to provide additional ideas for tests. The 3rd party contractor has been using VWO to set up surveys and perform additional research through the platform to provide more insight into the visitors on our website which helps structures additional tests. VWO is well suited to split url and a/b testing. Using this tool properly is key to improving conversion rates on your website. Performing research on your visitors is crucial to learning how people are interacting with your website and VWO's research and funnel platform have allowed for a much better analysis. User Review: "VWO - Good A/B Testing Tool"
I am currently using Visual Website Optimizer for clients to test large business questions, test out new products and/or features, and continuously optimize and improve their websites and other marketing channels. The business problems vary from client to client and is very dependent upon the business context and particular industry. When QAing experiments, it is extremely quick as goals fire immediately greatly reducing the time it takes to QA. Dashboards are easy to understand. The enterprise package has comprehensive add ons. Redirect experiments are difficult to create and the wildcard rules are often incorrect and can create problems for the user of the platform as well as the visitors. The main dashboard for experiments is actually based on cumulative transactions, not conversion rates of the specific variations which is confusing for newer users. Not communicated very well. The support and resources center are not very robust and often I find myself with more questions than answers. Basic A/B testing of websites as well as redirect experiments - If you are testing CTA colour, headlines, etc. and are just starting out your experimentation program, this will be very beneficial and help get you started. Conversely, if you are looking for a more robust solution, are more familiar with experimentation, and need more technical questions answered, it may not necessarily be the best place to start. VWO Review: "Easy to use A/B testing"
The product team uses it to A/B test copy, images and design across our website. It allows us to roll out and test features quickly instead of having to go through the dev team for minor requests. Once the A/B test is concluded, we put the change in the dev queue. Suitable for companies that have a decent amount of web traffic and want to quickly and easily test out new features without going through their dev team. Less appropriate for companies that with small web traffic (won't get statistical significance) or whose websites are very complex (in which case the tests may break design). VWO Review: "Great product for our A/B tests. Great support." We are using this as a simple way to A/B test our website in an effort to increase out e-commerce conversion rate. We also use this tool to gain some insight on where people are looking and clicking via the heatmap feature. We're a small business so there's not a particular department that uses this. Super helpful and responsive support team. Only thing is pricing could be lower for a small company. User Review: "VWO is great!" Presently we use it for testing and heat mapping our weekly promotional landing pages. We haven't been using it long enough to find holes. Great documentation - I would expand on it a little though. I can't think of anything it's not suited for, as far as testing your site, A/B testing, multivariate testing, or split URL testing. It's got all the tools you need for that. I wouldn't ask it to make me a club sandwich. VWO Review: "Look no further than Visual Website Optimizer for an affordable, first-class tool!" We utilize VWO for many of our site enhancements to better understand the impact on customers and ensure our hypothesis around each change is correct. It allows us to quickly set up and run two-tailed tests. Reaching significance is clearly defined with Revenue Per Visitor and Conversions and allows us to clearly see the chance to win or lose so we feel confident the new changes are warranted. We've been able to reduce abandonment rates and improve overall conversions by page and by product type with this service. The set up, configuration and previewing of tests is quick and easy. Checking results throughout the test cycle is clear and easy to report and understand how much more time is needed for the test to run. Calling a test and implementing the changes is done with confidence. There are some minor adjustments where changing the title of the control or variation or even the test can present an alert that a change was made which can't be cleared. I understand alerting when something may affect the data results but label changes in the VWO portal should not affect the metrics and therefore shouldn't add an alert message to the test. 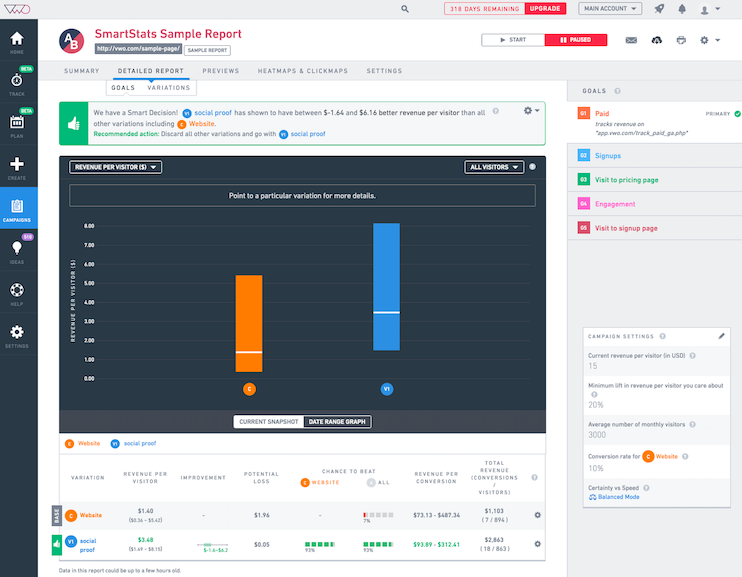 We're just getting started with their analysis set of tools to better understand customer interactions through click and heat map data but there could be improvement. For example, I've had challenges ensuring the tool showed the total available data for a particular page which required some regular expressions to ensure the total was displayed. It's a bit awkward to get working properly. User Review: "My impressions of VWO"
We develop test plans for clients. Our clients can select any testing tool they'd like, and when they select Visual Website Optimizer (VWO), we help implement and monitor the tests for them. We then analyze the results and create follow-up tests. It's perfect for a client who is just starting a testing program, or who wants to implement tests in-house rather than outsourcing. It's also priced affordably for entry-level clients.